Tortoises and turtles are among the oldest of all living reptiles and have evolved little in the 200 million years they have lived on Earth. There are around 89 species of Asian tortoises and turtles, all of which are threatened. There are around 89 species of tortoises and turtles. Slowly but surely, these ancient creatures will edge towards extinction unless action is taken to address illegal trade and ensure adequate protection is in place. The different species vary in size, with the largest being the Burmese mountain tortoise (also known as the Asian brown tortoise). It reaches up to 60cm in length and weighs up to 20-37kg. Most Asian turtles and tortoises are sexually diamorphic, with the female being up to 10cm larger than the male. Turtles and tortoises move too slowly to pursue active prey. Tortoises are mostly herbivores, although some species will also eat carrion. They feed on grasses, weeds, leafy greens, flowers, and some fruits. Freshwater turtles eat insects and aquatic larvae, crustaceans and aquatic vegetation. Most Asian turtles and tortoises dig themselves nests in mud or sand to lay their eggs. The hatchlings are born with a tooth egg to help them break out of the shell which is shed shortly afterwards. Most species do not care for their young, leaving the eggs and hatchlings vulnerable to predators. The most critically endangered tortoise and turtle species can become the most sought after - their rarity making them particularly valuable to the pet trade. Despite laws and regulations aimed at protecting turtles and tortoises, illegal trade in meat and shells continues to flourish. 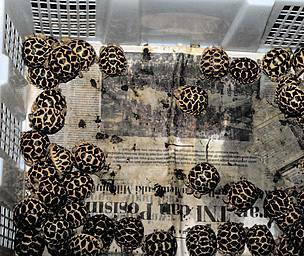 Many end up in markets destined for import to China, Hong Kong and Japan where there is demand for meat and turtle parts for use in traditional Chinese medicine. Restrictions on the sale of these endangered species are openly flouted, and the market continues to grow. Local people in southern Asian countries such as Cambodia, Vietnam, Indonesia, Malaysia, Bangladesh have traditionally collected local tortoise and turtle species for food. However, higher demand, particlularly over the last decade has led to greater exploitation of this species, leading many close to extinction. Loss of habitat through conversion to agriculture and wildfires have also had a detrimental effect on many populations. Asian tortoises and turtles are a WWF priority species. WWF treats priority species as one of the most ecologically, economically and/or culturally important species on our planet. And so we are working to ensure such species can live and thrive in their natural habitats. Raising public awareness of the plight of turtles and tortoises. Assisting in the collection of more reliable data on turtle and tortoise trade and its impact on populations. The Burmese mountain tortoise is also known as the six-legged tortoise because it has what appear to be 2 extra legs protruding from under the carapace. The 'extra' legs are in fact additional claws attached to the rear legs. 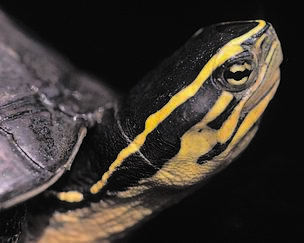 The yellow-margined box turtle is able to bring the plastron to the edges of the carapace when it withdraws its head. The turtle is effectively 'boxed in', protecting it from predators. 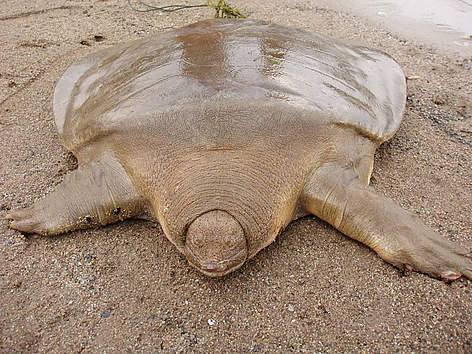 The Roti Island snake-necked turtle was so intensively collected for the pet trade, it went from first being described to near-threatened in the space of just 5 years.